Thursday evening at the Society of Illustrators is with "costumes." At my last session, both models were dressed as gun molls - and sketching was much more difficult than usual. 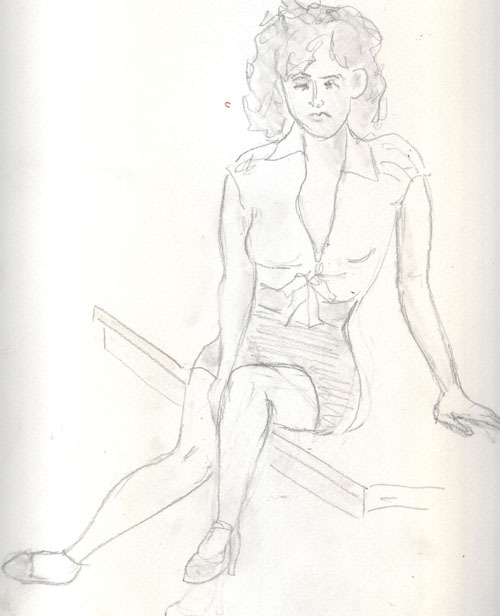 Here are several of my drawings that were "least bad." My current sketchbook is too big for my scanner, and I can't prevent the shadows on these drawings without transforming them in Photoshop like I did in the middle pose. While drawing these, we were listening to a 3 piece jazz combo - a real treat that is part of the experience at the Society of Illustrators. The Central Park Sketching and Art Meet-up Group met in Brooklyn Heights, on the Promenade, to sketch. The view of lower Manhattan is wonderful and it is hard to remember that the World Trade Center Towers were twice as tall as the tallest buildings in my photo. 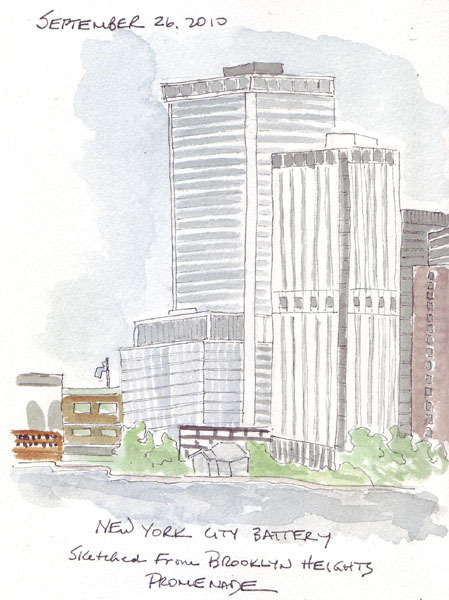 I sketched just the buildings at the very tip - trying to figure out how to best represent all of the windows. The tiny little orange object at the far left of my sketch is the front of the Staten Island ferry, pulled into the terminal. The Brooklyn Bridge is also part of this glorious scene. 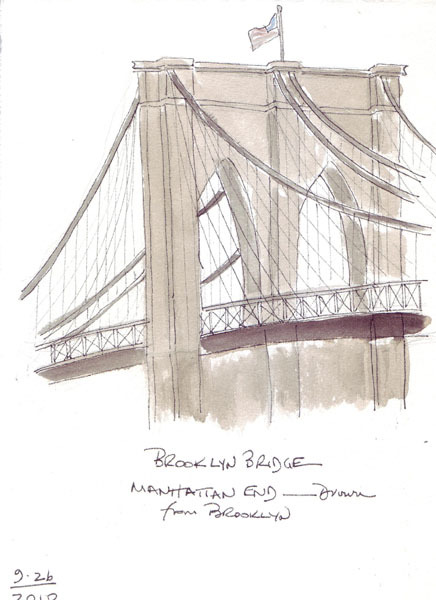 For my last sketch of the 3, I sketched the Manhattan towers of the bridge. 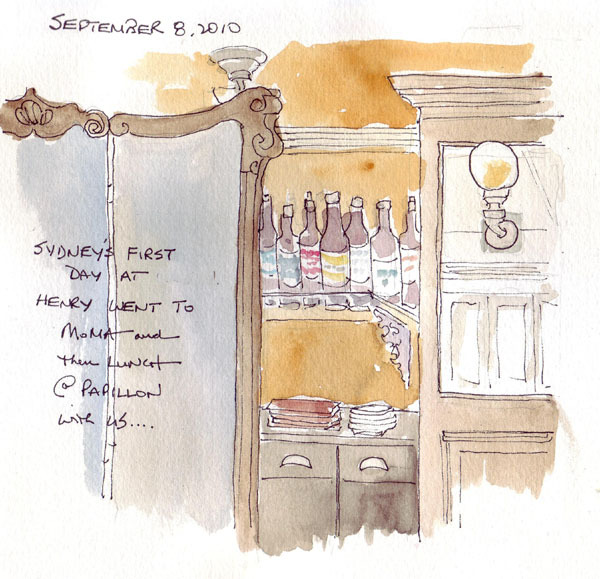 This sketching group now meets twice each month - and this year moved out of Central Park on many occasions. By scheduling one day each month on Sat. (11AM-2PM) and one on Sun, I usually can get to one of the sessions. Yesterday four of us from the Journal Study Group were there. I'm so glad that I went, because I rarely go to Brooklyn even though it is so close. Yesterday my husband and I went to an open rehearsal of the Philharmonic Orchestra in NYC - with Itzhak Perlman playing the Mendelssohn Violin Concerto. 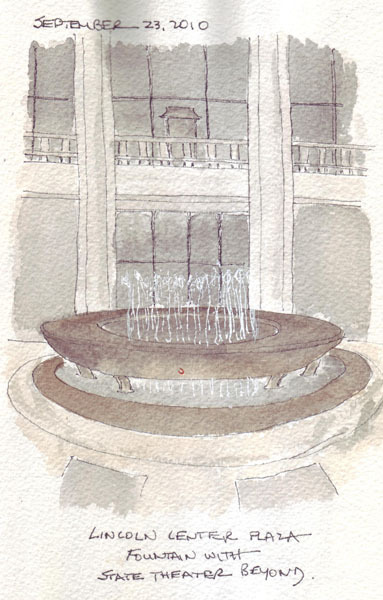 While my husband waited on line inside Avery Fisher Hall, I sketched the new Lincoln Center Plaza Fountain with State Theater behind it. I'm trying to fill up one of my first recycled books and it has paper that I hate. And my scanner also hates it and the buckling of the paper shows as dark shadows. It is great fun to see the Orchestra and Conductor dressed in jeans and T-shirts - and to hear parts of each piece several times while they work on it. 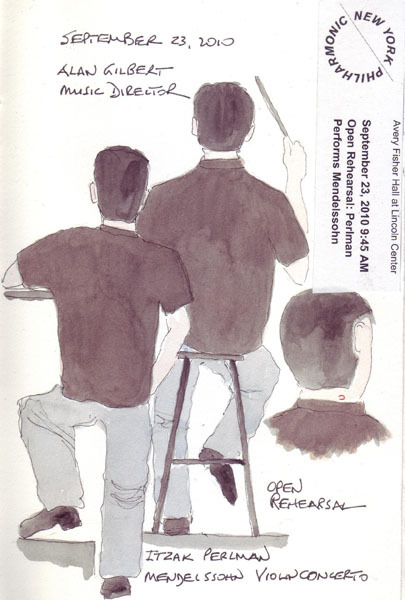 I'm getting better at sketching people who return to the same or similar positions frequently so I decided to sketch the Music Director, Alan Gilbert, while he was conducting the first piece. 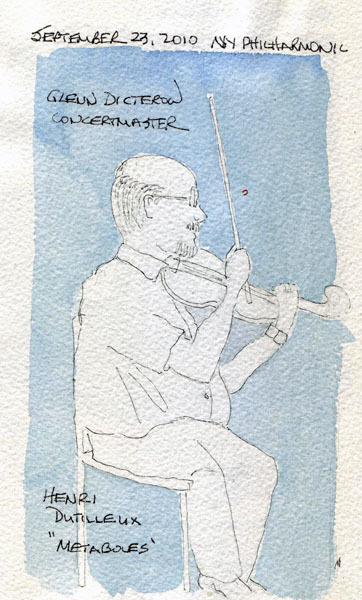 Then I sketched the Concertmaster. My blog has been down several times in the last week, and my poor son, who maintains the server it was on, had to come home from several long days at work and try to fix it. Last night he moved it to a new server, so I think it will be OK. Isn't he amazing? Although he is a self-taught computer guru, he is a busy physician and was packing for morning flight with his wife and my fabulous grand daughter Annabelle. A public thank you and a big hug for JJ. Two members of our Journal Study Group are in Europe at the moment, so Pat and I consoled ourselves with lunch, an art auction preview, the Pastel Society of America Show, and a late afternoon stop for coffee and sweets. Swann Galleries is auctioning several hundred prints of old New York today. so we went to enjoy them during the previews. I was so inspired by these drawings of master artists that I wanted to go out then and sketch my way through this wonderful City. We walked from Swann to Gramercy Park and went to see the current exhibit from the Pastel Society of America. Neither of us use pastels and were amazed at the photographic detail possible. 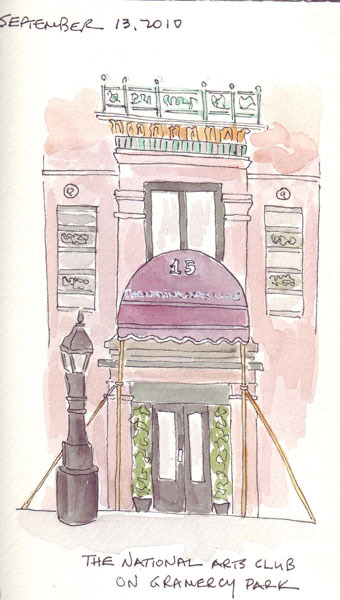 When we left the National Arts Club, we stopped across the street and did quick sketches of the entrance for me to work out my need to "sketch NYC." 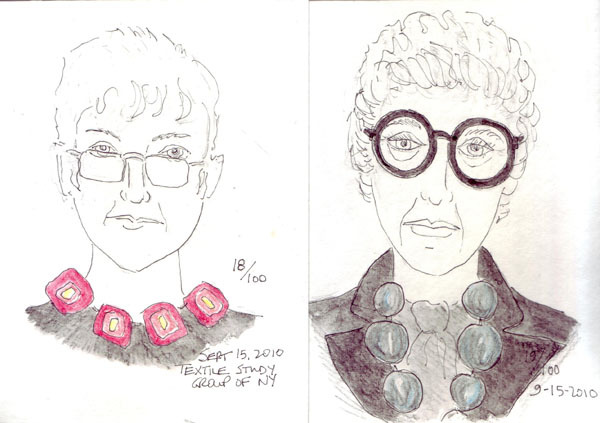 While drinking our coffee, both of us wanted to do another in our Carla Sonheim 100 Faces project. 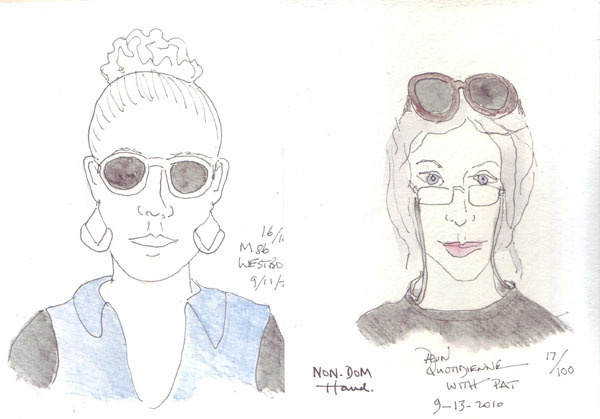 So we sketched each other, across the table, with our non-dominant hands. Quite a challenge. Here are 4 more of my Face series, these are all full face instead of profile like the last ones I uploaded. Pat is the one with sunglasses on her head and reading glasses on her nose! It makes her look really young which she says is OK, because in her mind she is 22 years old. 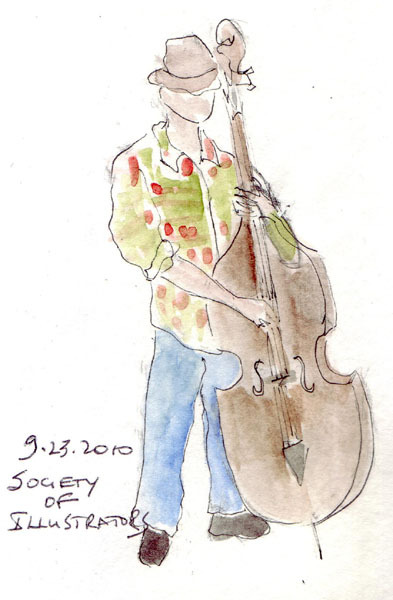 Most of the time my watercolor sketchbook is a visual journal and I try to incorporate part of my life in my sketch of the day. But I don't always think that I have enough time, or the perfect location, and I skip a wonderful opportunity. Catherine Carey of In and Out of the Studio wrote about this recently and I remembered it while we were eating a quick lunch with our 7 year old grandson after we took him to MoMA. "In this week's sketchbook journal workshop we have been talking a lot about painting very simply and quickly. It is not about laboring over a masterpiece. It is about getting the impression of "here and now" on the journal page. I understand that it is difficult to take a chance on a page being less than perfect, or even less than good, because someone might look at it, and of course, we will look at it ourselves and feel as if we have failed if it isn't great (or good). I think that I have made a dicision somewhere along the line that has made it easier to "let go" and just get it on the page quickly and simply. There are a lot of things in this world, and if I labor too long over each page, I'm just not going to be able to get to all those things. If I just do snippets here and there, I'm going to be able to cover a lot more ground. Decide what it is that made you stop to paint - and paint THAT. Then move on!" So I sketched during our special lunch, just the scene of the area where waiters were placing orders, and picking up bills, menus, etc. And Henry watched the drawing and then the painting, with great interest, making lunch and my journal page more special. I sketched what was in front of me quickly and painted it, and then was ready to move on! Now - to remember this!